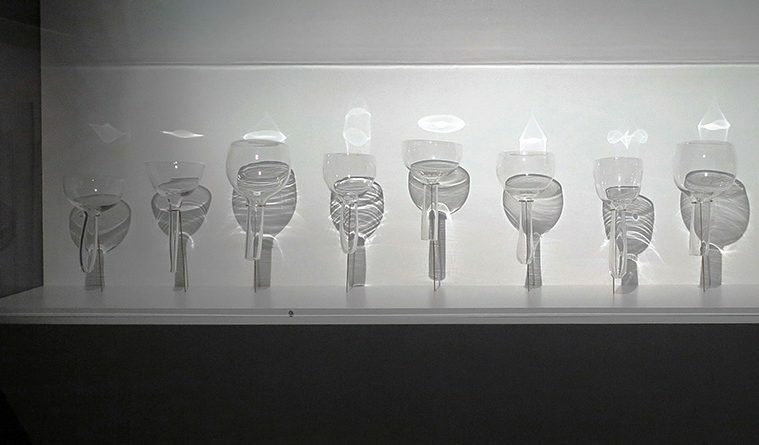 Blown glass, 17-channel color video with sound. One minute and 20 seconds. 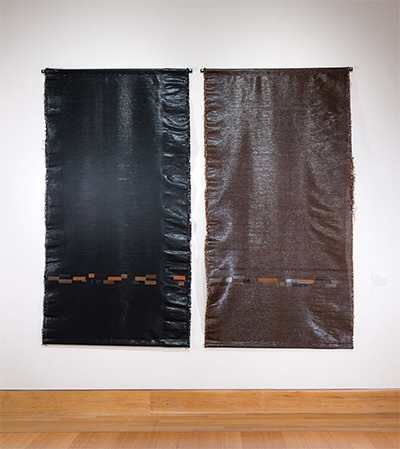 Alyce Santoro, Scroll Scores (Black: 136.1 Hz Edition, Brown: Between Stations Edition), 2015. Cassette tape, polyester, cassette-tape patches. 10 x 5 feet each. Photo courtesy of The John and Mable Ringling Museum of Art, “RePurposed” exhibition, 2015. Photo by Giovanni Lunardi. The world around us produces sound endlessly, incessantly. We tend not to consider it until it’s something out of the ordinary or a bit disruptive. A floor creaks as you step on a weak board; something thuds as you drop it on the table. We unwittingly use objects to produce sound, are in the presence of sound. We craft instruments to produce specific sounds, of course, but a hollow crate can be an instrument if you hit it with good rhythm. What happens, though, when artists incorporate sound into their craft? The Sound of Things, curated by Sarah Darro and on view at the Houston Center for Contemporary Craft through Oct. 28, showcases two artists who operate at the intersection of craft and music. In this exhibition, Darro presents works by Bohyun Yoon and Alyce Santoro. The two artists exhibit stark differences in their approaches to sound and craft alike, but they share an interest in exploring how the two play off one another. Visually, the styles are distinct. Placed in HCCC’s Artist Hall, the exhibition is separated into two distinct spaces, each attributed to one of the artists. Yoon is a glassblower who creates videos of performances remixed to hit the ear like electronica. 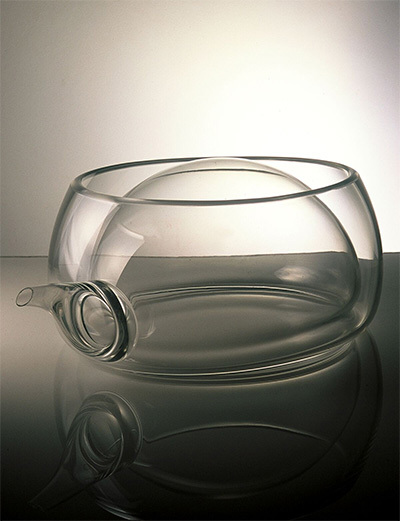 In the works on view, Yoon has crafted glass objects that produce and react to sound. Bohyun Yoon, Sound of Glass Helmet (Video Still),2004. Color video with sound. Three minutes. Photo courtesy of the artist. Glass Helmet takes the idea of singing glasses—akin to someone playing wine glasses—and develops into a performance about communication. In the accompanying video, Yoon and a partner are adorned with water-filled helmets. HCCC’s Artist Hall doesn’t permit space for 360-degree viewing, which makes this particular display a bit awkward and the projection a bit hard to see. From the proper angle, though, you see the pair play their own helmet and sometimes each others, splashing the water, rubbing the glass, or even pouring water from one helmet to the other. The performance becomes a conversation as the two people express themselves or combine their efforts. In its presentation, the podium is divided in half by a pane of glass where the video is projected. On each side sits one of the helmets. 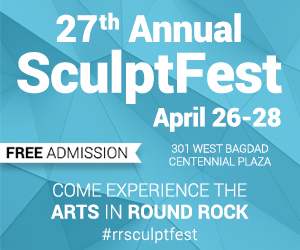 Texas-based Santoro has found multiple connections between her visual art and sound art through weaving, which bears a similarity to organizing sheet music and its own sort of rhythm. It’s here that the artist dug deep and found a means of amplifying these connections. In her series titled Sonic Fabric, Santoro approaches the aural aspects of her work by collecting sounds, recording them onto cassette tape, and weaving that tape with fabric. Apart from being a durable material and adding a noticeable glimmer to the works, the tape maintains its magnetism, allowing viewers to run a modified cassette player (or tape head) over the works to listen to the fabric. A sample fabric lies at the end of the hallway, available for some experimentation. Santoro does her own recording and fieldwork, individualizing the conceptual nature of each work while maintaining a common style throughout the series. This, too, is a point of difference between the artists. Santoro records and then manifests objects while Yoon crafts objects and then performs them. It’s a bit odd to look at these objects, so vastly different in their own presence and just similar enough to grouped together without question. Weaving and glassblowing have long, storied histories in the craft world. Driven by different motivations, distinct in their executions, the two collections on view in The Sound of Things expand our view of aural applications. We rethink the way we interact with objects. We wonder at what a suit could sound like.